Anti-Aging, Face Lift In a Jar! For firmer, more vibrant skin ... New Nutrient Complex Cream!! 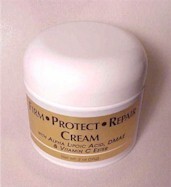 Protects Against Daytime Aggressions, Helps Rejuvenate sun damaged, aging sagging skin. Directions: For best results, apply to clean face, use twice daily morning and nighttime. Ingredients: Demineralized spring water, glyceryl stearate, soybean oil, stearyl, vegetable oil, cetyl alcohol, soy phospholipid liposome gel, alpha lipoic acid, DMAE bitartrate, ascorbyl palmitate (vit C ester), whole wheat protein, tocopheryl acetate (vit E), retinyl palmitate (vit A), ergocalciferol (vit D), aloe vera gel, allantoin, citric acid, polysorbate 20, simethicone, xanthan gum, methylparaben, propyparaben, imidazolidinyl urea. Copyright (C) 2002 All rights Reserved.